One thing I learned throughout the wedding planning process is even if the vendor (florist, photograher, etc.) doesn't work out you can still learn something during the meeting. 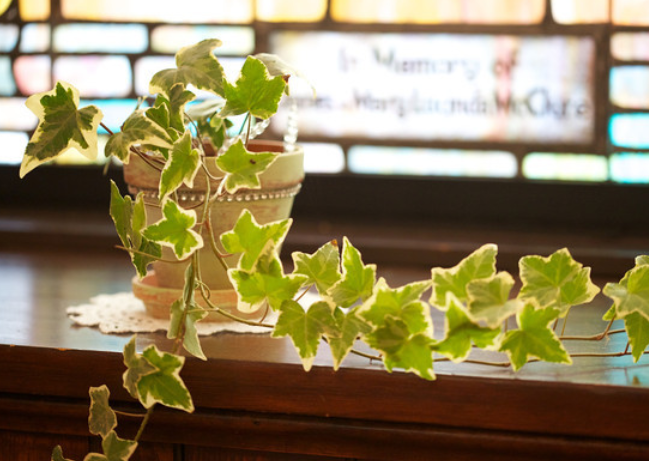 I got a great idea from a florist to fill the tall church window sills with ivy pots. DIY has a whole new meaning after planning my wedding! 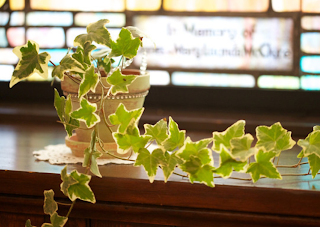 I went shopping with my mom for ivy pots for the church window sills and they were so pricey! About 10-20$ each, which added up with 10 church window sills. Step 1: Purchased 5 inch clay pots, light green Apple Barrel paint and a paint brush from Michael's Craft Store a. Step 2: Paint the pots lightly. One paint stroke should do, especially if you want the washed antique look. Step 3: Once the pots have dried, glue diamond rhinestones from Koyal Wholesale near the top of the pot. Step 4: Buy soil and Ivy. I bought some ivy from Pickering Valley Feed and Farm in Lionville, PA (you can buy ivy at any garden store). Step 5: Plant the Ivy. You don't need too much in each pot, it will grow and spread. Step 6: Care for your ivy!! Water them 2-4 x a week. When we were decorating the church the day before the wedding my sister and grandma added some crystal leaves purchased from Koyal Wholesale to jazz them up a bit! They look so pretty!